The journey of a thousand miles begins with a single step, and the path to Rock &apos;n Roll stardom starts with rat-infested cellars and dive bars. 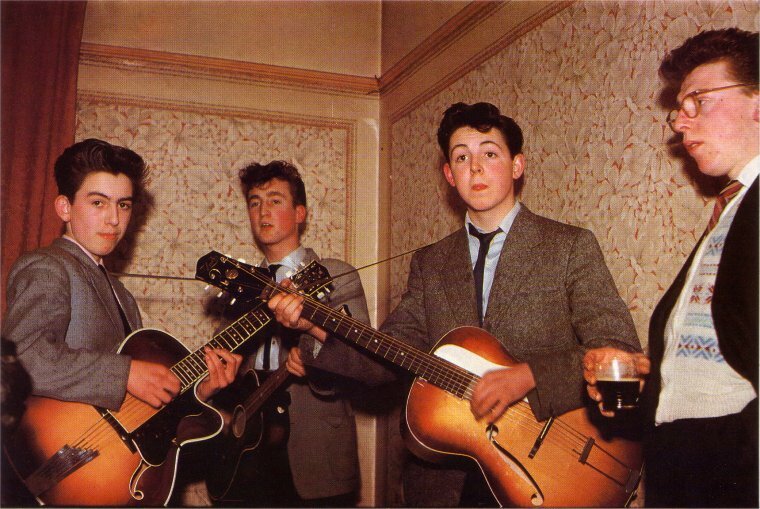 Everyone starts somewhere, even The Beatles. Nearly every great band works its way up from the bottom, and The Who, Oasis, U2, The Talking Heads and Nirvana are no exception. The difference, though, is that early performances capture bands at their hungriest — their rawest. These are the performances that show most clearly the spark that would precede a band&apos;s fame. Think you’ve seen your favorite band’s defining performance? Think again. 1. The Beatles at The Cavern Club in 1962. The Cavern Club, Liverpool’s dark and dingy subterranean rock hall, hosted a whopping 292 Beatles shows between 1961 and ’63. John, Paul, George and Ringo took home as little as £5 per gig (to split), and Harrison was nearly denied entry to their first gig because he was wearing jeans. Still, it’s fitting for a band named The Beatles to hone their chops in a musty cellar. Covering American singer-songwriter Richie Barrett’s “Some Other Guy,” McCartney sounds fresh and focused on lead vocals, rapidly tapping his Cuban-heeled boots to the beat of Ringo’s snare drum. It was here that the band learned their classics inside-and-out — a practice run that led to some of the greatest songs in the Western canon. 2. R.E.M. at Raleigh Underworld in 1982. It’s a good thing Michael Stipe wandered into Atlanta’s Wuxtry Records and started buying up all of employee Peter Buck’s favorite records. If he hadn’t, the singer and guitarist may never have crossed paths, and R.E.M. might still be a purely medical term. Performing breakout single “Radio Free Europe,” Stipe jerks his body around the stage, squinting and pressing his lips to the mic. Not to be outdone, Buck lays down a flurry of shimmering riffs, smiling to himself as sweat beads down his cheeks. 3. The Strokes at Arlene&apos;s Grocery in 2000. “Hello. Yeah. We’re the Strokes and we’re from New York City,” mutters a subdued Julian Casablancas more than a year before the release of his band&apos;s hit debut record. You only have to listen to the first minute of “Soma” to know these guys are going to be huge. Hammond’s guitar lines are fierce and jagged, and Casablancas shouts his lyrics with a boisterous, impatient urgency. The Strokes’ Arlene Grocery gig features an exquisite early performance of “New York City Cops,” too, which was scrapped from Is This It on account of the NYPD’s “valiant response” during 9/11. 4. U2 on &apos;Youngline&apos; in 1978. U2 scammed its way onto Irish TV by taking credit for a song they didn’t write. Two years before they released their first album, the band auditioned for Irish youth program Youngline, playing The Ramones’ “Glad to See You Go." When the show’s unwitting producer asked Bono if he’d written the song, the opportunistic singer quickly took credit and U2 got the gig. Once onstage, U2 pulled a switcheroo, subbing their own song, “Street Mission,” for Joey and Dee Dee Ramone’s punk classic. A feather-haired Bono, sporting white pants and a matching nylon jacket, sways his hips like a glam rocker, as Edge pitches in a sparse and stirring solo. The 17-year-old Bono couldn’t legally buy beer to celebrate his set, but he probably talked his way into a pint or two anyway. 5. Bruce Springsteen at Max&apos;s Kansas City in 1972. Bruce Springsteen wasn’t always “The Boss.” In fact, there was a time when dubbing the scrawny five-foot-nine kid from Jersey “boss” would’ve been a highly ironic gesture. He didn&apos;t know how he&apos;d grow up. 6. The Who at Marquee Club in 1965. Breaking onto the scene a few years after The Beatles, The Stones and The Kinks, The Who spent their early days in the shadow of their British brethren. But thanks to The Who’s jaw-dropping live chops, that didn’t last long. Performing at the Marquee Club in Soho, the band is utterly electrifying. Covering soul and Motown classics including “Heat Wave,” originally recorded by Martha and the Vandellas, they perfected their stylish controlled chaos. Roger Daltrey grimaces in pain, smacking a tambourine against his hip while howling into the mic. After churning out some dirty blues-rock riffs, Townsend unleashes a flurry of counterclockwise windmills and rams the neck of his guitar violently against an amp. 7. The Clash at Brighton Polytechnic in 1977. Most bands need a few years to find a voice and establish an identity. Not the Clash. Right from the get-go, they delivered a distinctive and rebellious message that was entirely their own. They played this gig the same year they released their first album, The Clash. Their gangly limbs, bleached hair, torn T-shirts and plentiful piercings have been touchstone punk memes for decades. Bombarding a crowd of rowdy college kids with "Capital Radio," The Clash attack their instruments with ferocious intensity. 8. Nirvana at Eagles Hall in 1988. Long before the conspiracy theories surrounding Kurt Cobain&apos;s death, Nirvana was just another Pacific Northwest band taking whatever work they could get. That includes an unlikely show at the Fraternal Order of Eagles Rec Hall in the small lumber town of Hoquiam, Wash. The setting seems more fitting for a PTA meeting than a grunge rock gig, but Nirvana gives it their all. "Papercuts," which would appear the following summer on the Seattle band&apos;s debut LP, Bleach, is loose and reckless, unrestrained by studio compromises. A flannel-clad Cobain shakes his greasy hair out of his eyes, while shirtless bassist Krist Novoselic glides across the stage. The jarring instrumental raucous evokes the same feelings of bitter angst and directionless rage that Nirvana would cultivate across its short shelf life. 9. Oasis at Glastonbury Festival in 1994. When asked how he would describe his band, Oasis songwriter Noel Gallagher wasn&apos;t exactly modest: "All the best bits of every band that anyone&apos;s ever liked." And that was before Oasis had even released an album. Sometimes, though, it pays to be cocky. Sharing the Glastonbury "B-stage" with Spiritualized, Blur and Chumbawamba, Oasis make their mark on "Live Forever." Liam Gallagher reminds us that he actually had an amazing voice before cigarettes and cocaine took their toll, and Noel&apos;s guitar licks are piercing and precise. Gazing into the crowd from behind black sunglasses, the Gallagher brothers proved they had the talent to match their egos. 10. Guns N&apos; Roses at the Roxy Theatre in 1986. According to a widely circulated infographic, Axl Rose tops Prince, Mariah Carey, Christina Aguilera and Aretha Franklin as the world&apos;s greatest singer. It&apos;s an indefensible title — even Rose dismissed it decades ago by confessing he&apos;d rather hear Michael Jackson, Janis Joplin or Freddie Mercury sing. Even if Rose isn&apos;t vying for the title of greatest singer, he still may be the world&apos;s most exhilarating frontman. On "Welcome To The Jungle" and "Paradise City," the Guns N&apos; Roses singer whirls the crowd into a frenzy as he belts out lyrics atop Slash&apos;s dense, distorted guitar lines. 11. The Talking Heads at Onodaga County War Memorial Auditorium in 1978. Most bands would balk at having to play a November gig in frigid Syracuse, N.Y., but beggars can&apos;t be choosers. Back in &apos;78, the Talking Heads were still trying to forge a following and score a single. Though it would be another year before the eclectic NYC outfit would crack the Billboard top 40 with their cover of Al Green&apos;s "Take Me to the River," the band&apos;s Syracuse show has them sounding poised and determined. Opening with "The Big County,"” stick-thin singer David Byrne sets a bucolic scene of rural idyll: "I see the shapes / I remember from maps / I see the shoreline / I see the whitecaps." At the start of a career of which few could dream, he was surveying the terrain.